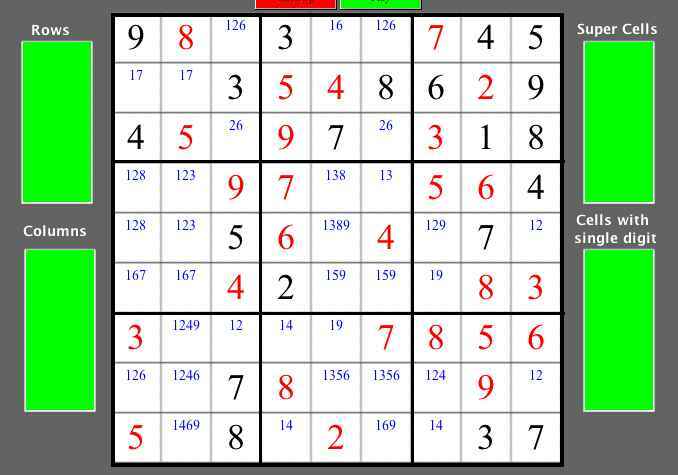 The purpose of this application is twofold: One is to provide a convenient medium for the solution of Sudoku puzzles and the other is to offer a tutorial, illustrating methods of solution that are easily overlooked. As a solution tool, you will be able to enter the puzzle (or look one up in the attached puzzle folder) and make entries by clicking on cells. 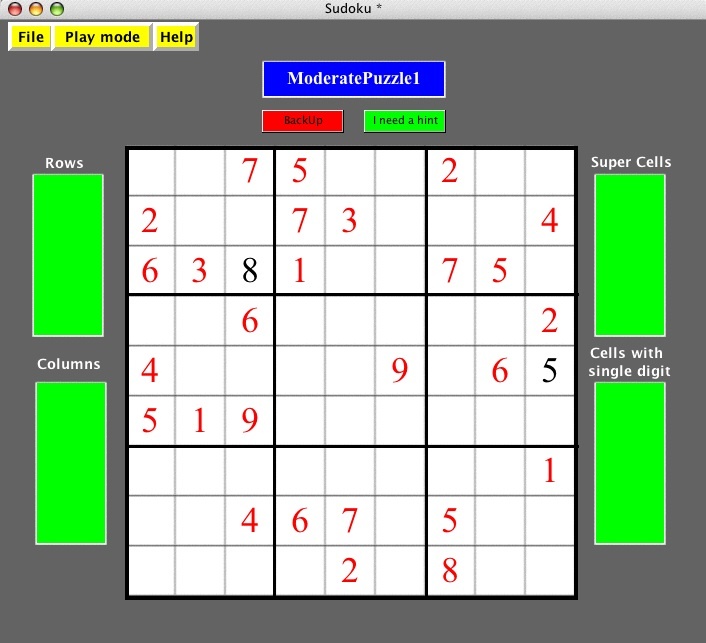 The screen-shot below shows Sudoku Utility used as a solution tool. The given digits are in red and those inserted by the user are black. The "Backup" button allows for undoes, and "I need a hint" button will put a question mark in a cell which has a determined value at the existing stage of solution. You may also choose to select the mode of play in which the application will refuse any wrong entry; you cannot make a mistake--comforting. As a tutorial, you will be able to see--in small, blue print--all possible entries in all cells, and, if you choose, hints to find what entries are currently permitted by rule, i.e. all entries in a given row, column, or block that are consistent with the conditions that all 9 digits appear in each row, each column, and each block. For example you see an 8 in cell Row 3, Column 3. This means that only an 8 is allowed in that cell. All OTHER digits are forbidden. You also see this information contained in the green field where it shows 3,3 #8; as you search along that row you see there is only one cell which allows an 8. You also see in the column titled "Rows" the line: "row 3, #2", meaning that in row 3 there is only one cell in which a 2 is allowed; as you can see, that cell is row 3, column 6. You can choose to show as much or as little of this information as you like. 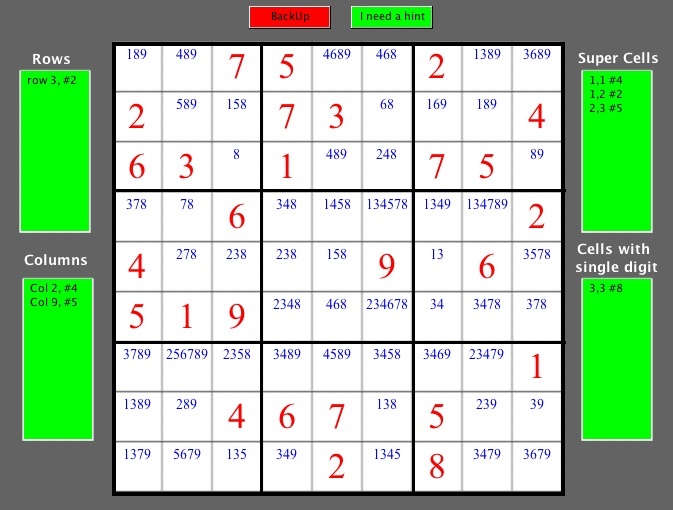 There is also an auxiliary application which will allow you to find the solution to any (hopefully) Sudoku puzzle--without guessing. It provides the ability to edit the allowed digits, the small blue numbers. For example in the situation below there is no cell with an immediately obvious defined value. But you see the digits 14 in cells 7,4 and 9,4. Since these are both in the same block you know that the digits 1 and 4 can appear now where else in the same block (or in the same column, column number 4.) You may therefore delete the digits 1 and 4 from all other cells in that block. You do this by holding down the command key on the Mac--the Alt key on the PC. If you do this in cell 7,5 and select the 1 from the drop-down menu you are left with just a 9 in that cell. You may therefore assign a 9 to this cell--select the 9 without holding the command/Alt key down. The rest of the puzzle is easy. This editing of the allowed digits (the small blue numbers) is performed in an ancillary window which you go to by selecting the "Solve the tough ones" from the Help menu. Certainly you wouldn't need this ancillary window in this simple case, but, believe me, there are many (very many) examples among the "VeryHardPuzzles" in the examples folder where it will be necessary to employ a number of such editing steps, each depending on the previous, before there is a cell with a clearly defined value. There is much more, but instructions and strategies are to be found under the Help menu in the application itself. Not knowing when to stop, I believe I have achieved the goal of every programmer in constructing an application of sufficient bloat that it is almost unusable. It is offered to the people of Nevada County on the assumption that there are times in life when one's prospects have been reduced to finding a refuge from boredom. This page last updated February 2, 2009. It's groundhog day and shadows are in abundance. So into hiding I go.